Originally from the Caucasus Mountain foothills of Iran and Turkey, this highly fragrant relative of the apple was once a commonplace orchard fruit in the early American Colonies. Quince was one of the first fruits introduced here by English settlers, and by 1720, their cultivation was thriving in Virginia. In the mid-nineteenth century, Reverend William W. Meech discovered an American variety of the fruit in Connecticut, which he introduced as the “Pear-Shaped Orange Quince.” In his 1888 book, Quince Culture, Reverend Meech described it as the “most uniformly prolific of all known varieties,” hence its name Meech’s Prolific. While this native variety is known for its reliable high yields and superior quality and remains popular by plant enthusiasts in England, Meech’s Prolific is now extremely rare in this country. The delicate, yet heady fragrance of the quince is said to be reminiscent of lemon, pineapple, flowers, and apple. 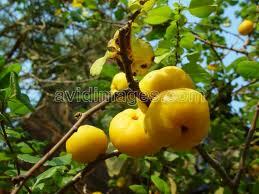 The claim of ancient traders was that a single ripe quince could perfume an entire caravan. Traditionally the quince was used by English colonists in pies mixed with apples or pears and sweetened with honey. 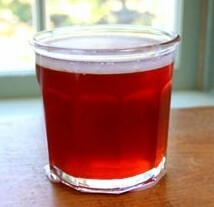 It was also used to make aromatic jams, jellies, and marmalades. In fact, the English word marmalade is derived from the Portuguese word “marmela,” meaning quince. Quince are generally not eaten fresh because of the hardness of the fruit and the acidity, astringent, and sometimes grittiness of its flesh . However, when cooked they are transformed into a beautiful rosy pink color with a unique flavor and delicate peach-like texture. 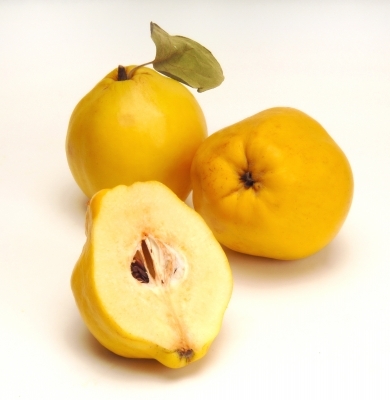 Quince can be used in the preparation of a variety of sweet and savory dishes from cakes and pies, to stews and chutneys, to fruit sauces as an accompaniment to chicken, beef, pork, and game. Another simple but delicious way of serving quince is to peel, core, and stuff them with raisins, nuts, and spices and bake them until tender. As American farmers moved westward, so did the quince, with sizable cultivations recorded in both Texas and California. By 1914, noted plant breeder Luther Burbank wrote that “the soil and climate of California are peculiarly hospitable to this fruit” where at the time there were about nine hundred acres of quince being grown. 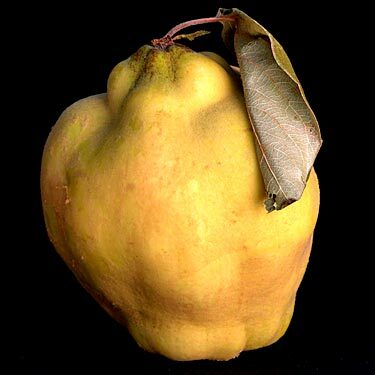 California remains the only state to commercially farms quinces, although the land devoted to its production has reduced to only about one-third of what it was in its heyday. Although practically unheard of for decades, today the quince, like other once popular but neglected fruits, seems to be making somewhat of a comeback. In recent years, there have been at least three books and numerous articles containing quince recipes. The fruit has also become an increasingly featured item in a number of high-end restaurants, and at least half a dozen have even been named after it. The quince is a seasonal fruit generally available only from early fall through January but may be found up until March in some areas. If you are fortunate enough to find them in your supermarket or green grocer, we recommend you pick up a few and rediscover the delights of this remarkably versatile but forgotten fruit.